Centipede is a 1980 video game developed by Atari. It is notable in that it was one of the few video games that was co-developed by a woman (Dona Bailey) and, also had a large female following. Centipede was a monster hit for Atari and it could be found in nearly every arcade in the early 80’s. Centipede is based on the standard Atari hardware of the era with a single 6502 CPU, a single Pokey chip, and a 16 color CRT. The concept of the game is pretty straight forward. The centipede starts at the top of the screen and moves down a level every time it encounters a mushroom. You must use your wand (blaster) to shoot the centipede before it gets to you. If you hit the centipede in a center section, it will split in two. You must also defend yourself from spiders that enter from the sides and fleas that fall from the top. Scorpions periodically run across the screen and ‘poison’ any mushrooms that they contact. If the centipede contacts a poison mushroom, it will ‘fall’ to the bottom of the screen. Centipede was ported to a number of home consoles and computers including the Apple II, the Commodore 64, and the Atari 800 and the Atari 2600, 5200, and 7800 consoles. In fact, it is one of the few games to be ported to all 4 of Atari’s 8-bit game systems. In 1982, Atari released Centipede for the VCS/2600 and, when you power up your 2600 with a Centipede cartridge installed, you will be amazed with the start screen…you will think that you are about to see an amazing graphical port for the 2600. Unfortunately, the start screen is as far as the amazing graphics go. The game graphics are disappointing as the mushrooms have become simple square blocks. As far as the game play goes, however, the 2600 version has it all…mushrooms, spiders, fleas, and scorpions. It plays as close to the arcade version as any 2600 port. In fact, Centipede is one of the top games for the 2600! When the 5200 SuperSystem was introduced in 1982, Centipede was one of the early releases. Given that a Centipede arcade unit has the same basic CPU and sound chips as a 5200, it should be no surprise that the 5200 version is a classic port. Like the 2600 version, all of the arcade elements are present, but this time the graphics and sound are spot on. Control with a standard 5200 joystick is solid, but the 5200 version supports the use of the Trak-ball unit. Centipede is one of the top games available for the 5200. In 1987, Atari released Centipede for the 7800 ProSystem. Even though the 7800 lacks the sound capability of the 4 channel Pokey chip, Centipede is well executed with a nice start screen, great graphics, and more than adequate sound. The only thing negative to say about the 7800 graphics is the box that is drawn around the screen. The 7800 version makes up for any shortcomings with neat two player modes. Two players can alternate turns, play against each other (at the same time), or play together as a team. It is hard to say which version of Centipede is the best port. The two player modes in the 7800 version make it a blast to play with a friend, but I give a slight edge to the 5200 version for its accuracy to the arcade version. No matter which Atari home console you have, a copy of Centipede belongs in your game collection! Categories: 2600, 5200, 7800, Atari, Game Reviews | Tags: 2600, 5200, 7800, Atari, Centipede, Game Reviews, VCS | Permalink. 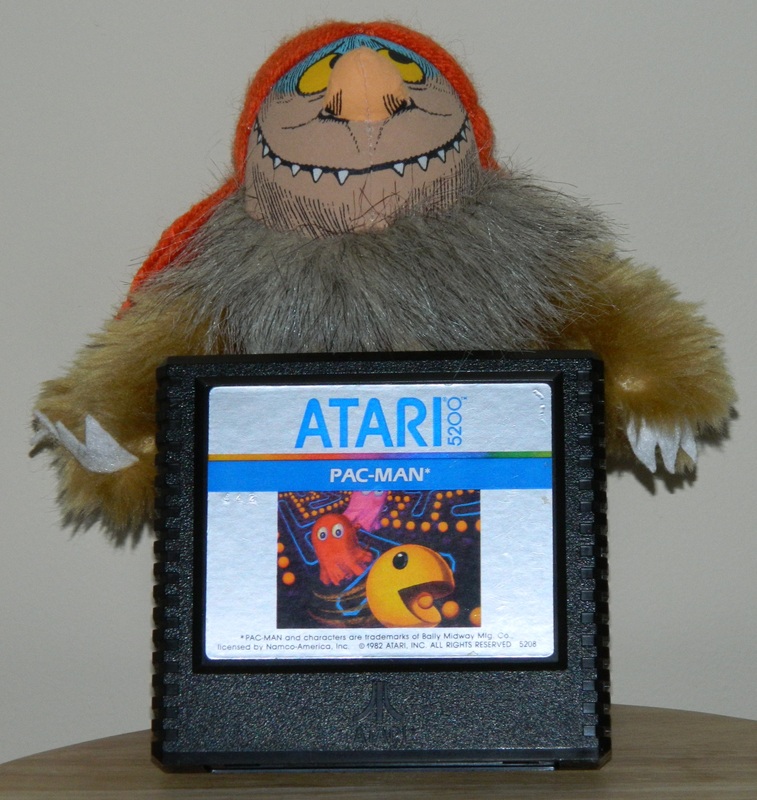 There were only two officially released Pac-Man games for the 5200 (Pac-man and Ms. Pac-Man), but thanks to the efforts of the Atari community, there is now a complete library of Pac-Man games for the Atari 5200. Pac-Man was one of the launch titles for the 5200 and it is pretty darn good. In fact, compared to the rather pathetic 2600 version, this game is almost arcade perfect. The maze has been modified to fit a TV screen, but, otherwise it is all here. Great colors, arcade like graphics, no flicker, and even intermissions! The only complaint that one could have would be with the 5200 controllers making it difficult to navigate the maze. I tested the game with a newly re-built controller and found that it only took a few minutes to get used to the feel of the analog joystick. Pac-Man became the ‘pack in’ game for the 5200 in 1983, so it is easy (and cheap) to find a copy. Pac-Man belongs in every 5200 game collection. If you want to play a good game, made even better, Bob ‘Pac-Man Plus’ DeCrescenzo ‘hacked’ the 5200 version of Pac-Man to correct some short comings. Specifically, Bob fixed the ‘flashing’ of the ghosts, the speed of the game to match the arcade version, and the board where the energizers last forever. Bob’s version is not available on cart, but you can play it on an emulator or multi-cart. Read here for more about Bob’s fixes for Pac-Man. Bob ‘Pac-Man Plus’ DeCrescenzo ‘hacked’ the 5200 version of Pac-Man to create Pac-Man Plus. Bob changed the mazes to be green, changed the ghosts to have leafs on their heads, and changed the fruits to match the bonus items in the arcade version. He also added some of the other Pac-Man Plus features such as sometimes having the maze turn invisible and having one of the ghosts sometimes not turn blue. Be warned that these changes make this game more challenging to play, so you will not get bored quickly. I don’t think that this variation has been made available on a cart, so you will need a multi-cart or emulator to play this version of Pac-Man Plus. Read more about Bob’s development of this game here. Hangly-Man was a 1981 clone of Pac-Man by Nittoh. It is really just a ‘hacked’ version of Pac-Man in a regular Pac-Man cabinet. The game play is similar, but the mazes are slightly different. Also, on the third maze and every odd maze after the third maze, the maze is not a maze at all. There are a few other differences from Pac-Man that is well documented here. Once again, Bob has come to the rescue and created a version of Hangly-Man for the 5200. In the development of his games, Bob always pays attention to detail and this ‘hack’ is no exception. All of the major features of Hangly-Man are present in Bob’s version. I don’t think that this variation has been made available on a cart, so you will need a multi-cart or emulator to play this version of Hangly-Mans. Read more about Bob’s development of this game here. Perry Thuente started with the 8-bit version of Pac-Man and developed Pac-Man Arcade. He then ported his 8-bit version to the 5200. If you are a fan of Pac-Man and have a 5200, then you will want to get a copy of this game. Perry will either make a cart or provide a copy of the game for your multi-cart for a very reasonable price. Differences from the ‘standard’ 5200 version includes great title and intro screens, a better looking maze, better looking ghosts (with white eyes), and improved sounds. You can read more about Perry’s work here. Ms. Pac-Man was an official release for the 5200 and is an excellent arcade conversion. Developed by General Computer Corporation and released in 1983, Ms. Pac-Man demonstrates the strength of the 5200 as a great home console for arcade ports. This game has great graphics, intermissions, four different mazes, bouncing fruits, and four mostly flicker free pesky ghosts with white eyes! The AI for the ghosts was improved in Ms. Pac-Man, so they are definitely pesky and more difficult to avoid. Fortunately, you get five lives as you are going to really need them! Ms. Pac-Man is not quite as easy to find as Pac-Man, but should not be considered a rare title. A copy Ms. Pac-Man should have a home in every 5200 collection! Super Pac-Man was developed and completed for the 5200, but never officially released. This is really a shame, as this game is almost arcade perfect. The colors are bright, all of the arcade features are included, and this game provides some variety from the ‘standard’ Pac-Man format. AtariAge produced a few carts of Super Pac-Man, so you might be able to find a copy or ask them to make you one. Otherwise, you will need a multi-cart or emulator to play this game. You can read more about the 5200 version of Super Pac-Man here. Jr. Pac-Man is another great game that was developed for the 5200, but not officially released. This version is very close to the arcade and, like the arcade, the screen scrolls horizontally, there are six power pills, and the fruits have been changed. As the fruit bounces, it changes the dots into larger, more valuable dots, but can also destroy the power pills. Since this can be happening off-screen, there is some additional strategy to Jr. Pac-Man than other versions. The only negative thing to say about the 5200 version is that there is some flicker with the ghosts, but nothing that detracts from the game play. AtariAge produced a few carts of Jr. Pac-Man, so you might be able to find a copy or ask them to make you one. Otherwise, you will need a multi-cart or emulator to play this game. It is really too bad that Atari never released this game as it would have been a big hit with 5200 owners. You can read more about the 5200 version of Jr, Pac-Man here. Thanks to the Atari community, at least seven great versions of Pac-Man are available to be played on the 5200. It is always hard to pick a favorite, but, on the 5200, I really enjoy the extra strategy and difficulty of Pac-Man Plus. Categories: 5200, Atari, Game Reviews | Tags: Atari, Game Reviews | Permalink. Released in the fall of 1977, the Atari 2600 was originally known as the Video Computer System and became the 2600 after the 5200 was released. It was also sold by Sears as the ‘Sears Video Arcade’. In the first year of production, the systems were actually made in Sunnyvale and had six switches and heavy, internal, RF shielding. These units are known as ‘heavy sixers’ and are highly sought after by Atari collectors. Over the years, many different versions of the 2600 were released. In 1985, the final version called the Atari 2600 Jr was released. This version was smaller and less expensive to produce and looked like a small 7800. The final Atari 2600 was produced in late 1991. The 2600 was powered by a custom 6507 8-bit CPU running at 1.19 Mhz. It only had 128 bytes of ram and 4 KB of rom. Until bankswitching schemes were developed, game cartridges were limited to 4 KB. Ultimately, some late released games had as much as 32 KB. Over 500 games were developed for the 2600 and hobbyists continue to develop new ‘homebrew’ games for the system. Released by Atari in 1982, the 5200 was intended to compete with the Intelivision system, but also ended up being Atari’s answer to the Colecovision. Atari had attempted to develop a system to replace the 2600, called the 3200 (based on a 10-Bit CPU). This system was difficult to program and was cancelled. Needing a solution in a hurry, Atari took the design of the their 400/800 computers and made that the base of the 5200. The 5200 has unique controllers with a keypad and analog, non self centering, joysticks. These controllers are notorious for failing and contributed to the limited success of the 5200. The other limiting factor was that it was not backwards compatible with the 2600. Eventually an adapter was released, but it did not work with early versions of the 5200. This is too bad as the 5200 is actually a pretty awesome game machine and has arcade quality graphics and sound. The 5200 is powered by 6502 8-bit CPU running at 1.79 Mhz. It has 16 KB of ram and 2 KB of rom and can accept cartridges up to 32 KB without bankswitching. The 5200 also includes a Pokey chip that allows for 4 channel sound. Two different models of the 5200 were released. The early models had 4 joystick ports and a ‘high tech’ RF switch box. Later models had two joystick ports and a standard RF switch box. A few games (such as Pitfall) only work with the 4 port version and the 2600 adapter only works with 2 port versions and a few late release 4 port units. A total of about 1 million 5200’s were sold between 1982 and 1984, when the system was discontinued. A total of 69 games were officially released for the 5200, but many other games have been ported over from the 8-bit computer line. Additionally, many other games were developed, but not released. Over the years, the roms of many of these games have been located and released to the public. Homebrew development has continued as well for the 5200, but not at the level of the 2600. One notable game, Tempest, was just released this month. The Atari 7800 was released in 1984, shelved, then released again in 1986. This was due to Atari’s sale to Jack Tremiel and contract issues between Warner and General Computer Corporation (GCC) (the 7800 was actually developed by GCC for Warner). The 7800 was powered by a 6502 8-bit CPU running at 1.79 Mhz. It is directly backwards compatible with the 2600 and runs at 1.19 Mhz when in ‘2600 mode’. The 7800 has 4 KB of ram and 4 KB of rom and can accept cartridges as big as 48 KB without bankswitching. It was designed as an ‘home arcade system’ and has arcade quality graphics and can manipulate a significant number of sprites without flicker. The 7800 has two joystick ports (backwards compatible with 2600 joysticks and paddles) and shipped with ‘Pro-line’ digital joysticks with two fire buttons. Many 7800 games only use one fire button and can be played with 2600 joysticks. The biggest limitation of the 7800 is that it does not include a Pokey chip and only has two channel sound. Provisions were made to include Pokey chips in game cartridges, but only two games include a Pokey (Commando and Ballblazer). Less than 100 games were developed for the 7800, but it had the added advantage of being able to directly play almost all 2600 games. Like the 2600, there is active homebrew development for the 7800 and more than twenty additional games have been released for the 7800 in the past few years. About 4 million 7800’s were sold making it a moderately popular game system. Released by Atari in 1987, this was essentially a repackaged 65XE computer. The XE Game System shipped with three games (Missile Command, Flight Simulator, and Bug Hunt), a joystick, a light gun, and a detachable keyboard. It could use most Atari computer peripherals and was able to play most all of the games developed for the Atari computer line. A tremendous number of games were developed for the Atari computer line, so the XE Game System can play a huge number of game titles. Since it includes a keyboard, it can also play more sophisticated games like flight simulator. The XE Game System had limited commercial success and was cancelled in early 1992. In 2005, Atari released the Flashback 2. Designed by Curt Vendel, the FB 2 contains a ‘2600 on a chip’. It includes 42 built in games and it is possible to add a cartridge slot to the unit. Between the 2 and 2+ (released in 2009), the FB2 has sold nearly 1 million units. More detail on the FB2 can be found in my January 8th post. Categories: 2600, 5200, 7800, System Reviews | Tags: Atari VCS 2600 5200 7800 XEGS | Permalink. The Atari Flashback 2 is the system that Curt had in mind when he approached Atari about the Flashback concept. In 2004, not enough time was available for development, so Curt went with the ‘NES on a chip’ design for the Flashback 1. When he was done with the Flashback 1, he returned to development of what is now known as the Flashback 2. With plenty of time for development, Curt designed a custom chip to produce an ‘Atari 2600 on a chip’. Curt also included provisions on the motherboard for adding a cartridge slot. A modified Flashback 2 can play most games designed for the 2600. Taking a page from the Atari playbook, the name for the FB 2 project was ‘Michelle’ for Curt’s wife. Her name is printed on the FB 2 motherboards. The FB 2 is an amazing console. Although the last production run was in 2009 (with the Flashback 2+), they are still relatively easy to find second hand. I paid about $20 for my FB 2, but consider it a bargain if you can find one for under $30. With 42 games and a set of compatible joysticks, it is really a steal. The only thing to be aware of is that it doesn’t work well with some ‘modern’ TV’s. It worked great on my non HD TV, but some games did not display correctly on my Vizio HD TV. At this point I have tested and written about all four Flashback units. If you are looking for some Atari retro game fun, you can really not go wrong with either the FB 2, 3, or 4. Due to it’s excellent emulation, 75 games, HD TV compatibility, and wireless controllers, I give a slight edge to the FB 4. If you want to play games as Atari originally intended, then I highly recommend the FB 2! Categories: 2600, Atari, System Reviews | Tags: 2600, Atari, Flashback, retro, VCS | Permalink.